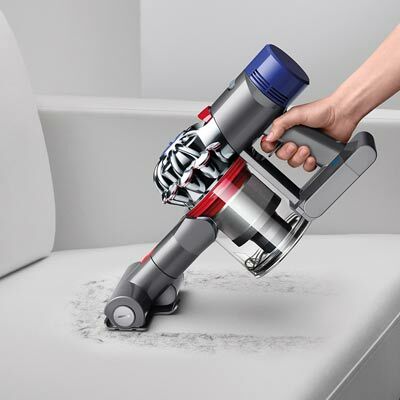 Dyson’s Newest Vacuum Cleaners Lineup – SmartReview.com met with Dyson to review its latest vacuum models. 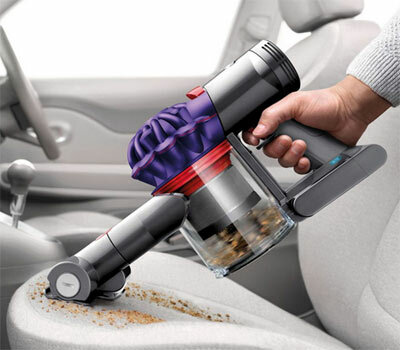 Many of the latest models include a new cyclonic technology called Dyson Cinetic Science, which eliminates the need for a filter, so nothing to clog, clean or replace. 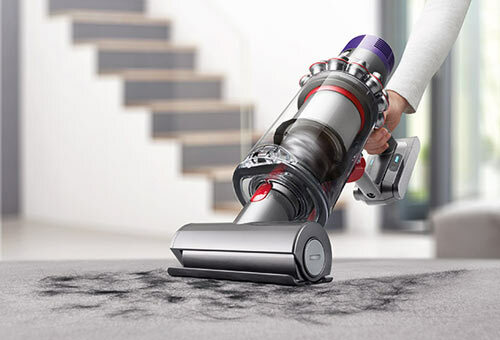 The all new Cinetic vacuum lineup includes the Dyson Cinetic Animal+Allergy “Big Ball” Upright, the Dyson Cinetic Animal “Big Ball” Upright, and the Dyson Cinetic Animal Canister Upright. All of these models are the best in their category, have received high consumer reviews, and have received the BEST OF 2018 & 2019 awards from SmartReview.com in the bagless vacuum categories. We got a full explanation of the new cinetic science, (see video below). All of the cinetic vacuums come with the fantastic handheld “Tangle Free Turbine Tool” to vacuum hair and pet hair easily without tangling in the brush bar. 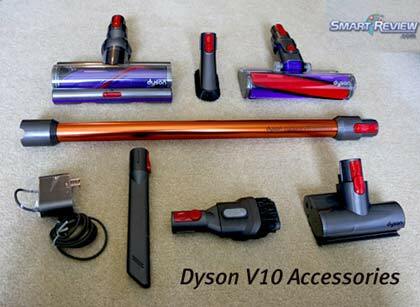 There is nothing like this on the market and is exclusive to Dyson. Below is a review and comparison of the latest models. 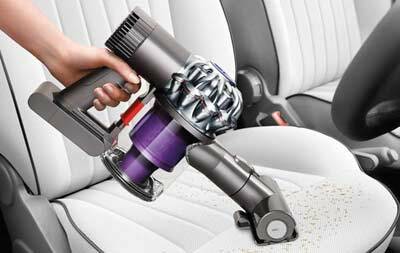 For 2018-2019, Dyson introduced the V10 Cyclone series of cordless vacuums. It has more suction than other models, has a larger bin, and an inline configuration. Most of the V7, V8, and V10 come equipped standard with whole machine HEPA filtration. 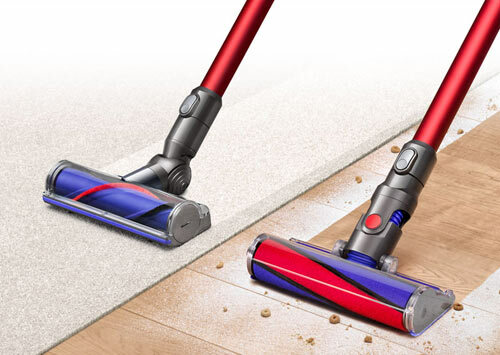 The Dyson V8 Absolute and the Dyson Cyclone V10 Absolute also come with the Fluffy Soft Roller Hard Floor Tool. The Fluffy floor tool allows you to pickup large particles and superfine dust at the same time. No more pushing cheerios with your vacuum, this roller will trap and then vacuum up those large particles, as well as fine dust. All of the Dyson cordless line is lightweight (less than 6 lbs.) for easy maneuvering. 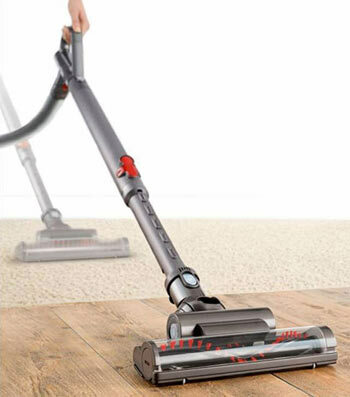 All of these can also be configured to an even lighter handheld vacuum. Like the corded Dysons, these cordless models use the latest Cyclone Technology so that there is no loss of suction. These cordless vacuums do not rely on the filter to trap dirt, and they have a lifetime washable filter. We gave the Dyson V8 Absolute and the Dyson Cyclone V10 Absolute our BEST OF 2018 awards for cordless vacuums, as they earned it. 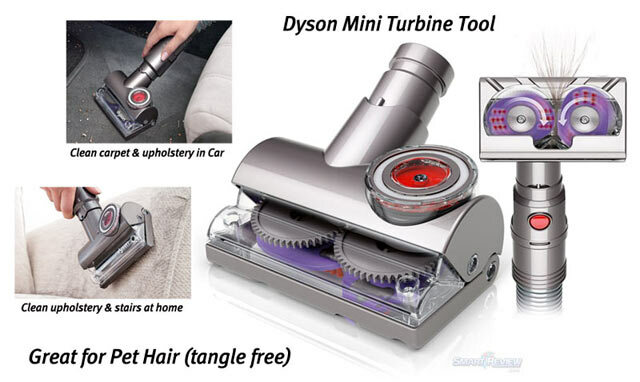 Both of these models include the Mini Motorized Tool which is great for use on car mats, pet hair, upholstery, stairs, and other uses. What really impressed us was how easily the V7, V8, and V10 series was able to slip under beds and furniture. You just can’t do this with a full sized vacuum. Few vacuums can fit in such a tight space. The Dyson line of cordless vacuums will give you the power of an upright, but in a lightweight package with no cords to tangle. 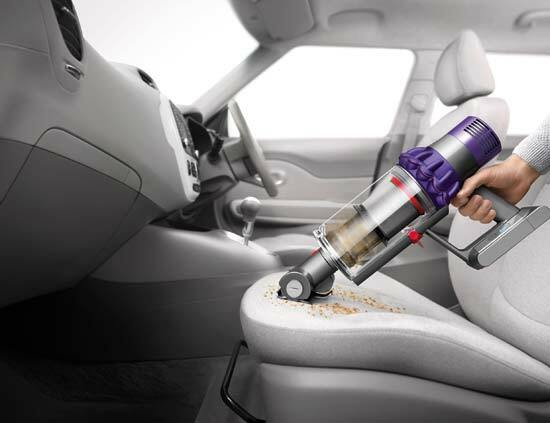 The tools snap together very easily, as this is a very well designed vacuum. There are many tools that can be used, and the Absolute models come with many accessories. A MAX mode is available giving more suction for those really hard to clean areas. The V10 has the longest runtime of 60 minutes for suction only at the lowest power setting. 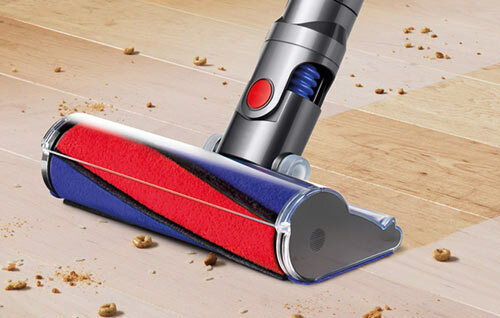 Dyson cordless vacuums are the best on the market. 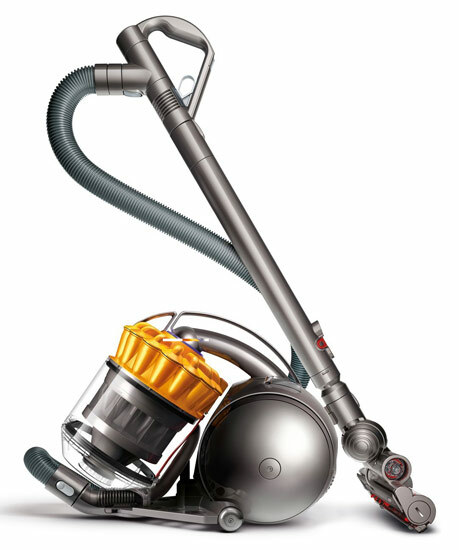 The Dyson Ball Multi-Floor Bagless Canister Vacuum. Dyson Ball Multi-Floor Bagless Canister Vacuum: The Multi-Floor is the current, least expensive Dyson canister vacuum. 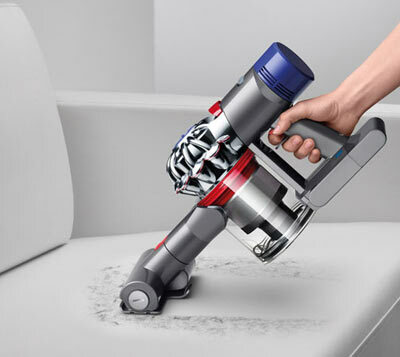 The Dyson Ball Multi-Floor Canister has lifetime filters, HEPA Filtration, Radial Root Cyclone™, Ball technology for easy maneuvering, and a Triggerhead™ Floor Tool, with an air-driven rotating brush bar which can be turned on and off (for delicate rugs, and hard floors) from the handle, so no bending down is required. The Multi-Floor is great for carpets as well as hard floors. The Dyson Cinetic Animal Bagless Canister Vacuum. Dyson Cinetic Animal Canister: Dyson’s canister vacuum with Cinetic Science. The Cinetic Animal Canister does away with filters, as the new flexible tips on the end of the cyclones removes fine dust and dirt. The tips vibrate at 5,000 times/second. 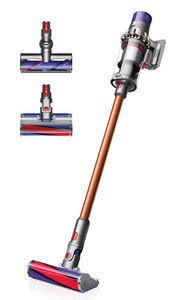 The Dyson Cinetic Animal Canister Vacuum features whole machine HEPA filtration, Cinetic Science, Ball Technology for easy maneuvering around furniture, a bin cleaning tool, a new improved air driven carbon fiber/nylon brush bar, and the fantastic handheld “Tangle Free” Turbine Tool to vacuum hair and pet hair easily without tangling in the brush bar. Use on upholstery, stairs, hard to get areas, car interiors, and pet hair areas. Video: Mini Turbine Tool.